It dates from around 900. Read more about it here. Polyphony was being discussed at this time, but the earliest written notation up to now was from a century later. It is organum, but not a simple matter of the one part being five notes below the other; the interval varies. It undermines the assumption that the earliest polyphony was organum carried out mechanically, with one voice following the other at a fixed interval. Sancte Bonifati martyr inclite Christi te quesumus ut nos tuis precibus semper gratiae Dei commendare digneris. O holy distinguished martyr of Christ, Boniface, we beseech you that you should always see fit in your prayers to commend us to God's grace. With the name of 'Vitus' instead of 'Boniface' the text occurs as the single antiphon for the Vespers psalms for Vitus in two Austrian MSS of the 14th century, one of which has images on the Cantus website. This was probably the antiphon for Vespers for St Boniface. At the beginning of July 2013, two years after the previous meeting at Douai in May 2011, the Chant Forum gathered at Quarr Abbey on the Isle of Wight. There had been no such meeting in 2012, because the Monastic Musicians that year made Gregorian Chant the focus of their own annual session. This Quarr event was the seventh Chant Forum gathering. Hitherto the formula had been for a meeting of two full days only, but this time we made it three full days. Two opportunities for chant training in London are being organised by the Schola Gregoriana of Cambridge. They will take place in conjuction with special Sung Mass for two different events: the training will enable a larger group of amateurs to take part in singing for these Masses. 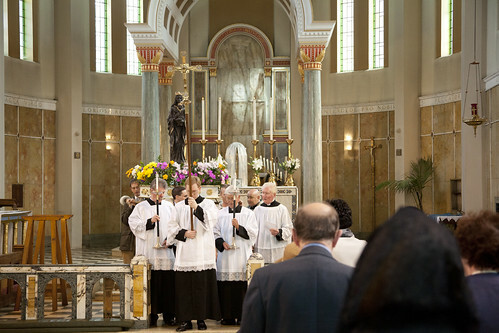 The Masses are the Latin Mass Society Pilgrimage to Our Lady of Willesden, in North West London, on Saturday 31st May (feast of Our Lady, Queen). The Shrine is at Acton Lane, Willesden, London NW10 9AX. Click for a map. and the LMS-sponsored 'Chesterton Pilgrimage' (to seek GK Chesterton's beatification), where Mass will take place in Our Lady of Lourdes Uxbridge, on Wednesday 30th July. The church on the Osborn Rd (or, more simply, next to the A4020), and the post code is UB8 1UE. Click for a map. Anyone who would like to join the Schola Gregoriana on either occasion please get in touch with the Schola Gregoriana in advance. Numbers are limited only by the capacity of the choir gallery! And they are both a pretty large. LMS Pilgrimage to Our Lady of Willesden, last year.